Every fossil tells a story. With each new find our knowledge of prehistoric life becomes a little clearer. As palaeontologists, our goal is to uncover, identify, interpret and share our research and findings. As is the nature of science, research can (and does) become out of date as one new study provides the basis for the next – a foundation for others to learn and challenge. Life reconstruction of Shonisaurus, a giant Late Triassic ichthyosaur from North America. © Nobumichi Tamura. As outlined in my previous article, when dealing with fossils, it can be very difficult to uncover the correct identity of isolated or fragmentary remains. As has happened in the past, many incomplete and isolated remains have been misidentified as belonging to other animals. One of the best examples is the Cambrian arthropod Anomalocaris. Prior to the discovery of a complete specimen, individual parts of Anomalocaris had been identified as other animals. The appendages were misidentified as the body of a crustacean-like creature whereas the mouth was mistaken for a jellyfish. We live and learn. In my latest study, I look at a recent discovery that has helped solve an almost 170 year old mystery. In May, 2016, fossil collector and co-author of the study, Paul De la Salle of Swindon, UK, was searching for fossils on the beach at Lilstock, Somerset and found pieces of a giant bone. In June, he returned to the site and found more pieces, which together measured about one metre in length. Paul identified this as the lower jaw from an ichthyosaur and contacted Prof. Judy Massare (SUNY College at Brockport, NY, USA) and me. To say we were very excited would be an understatement. Paul also enlisted the help of Dr Ramues Gallois, a geologist who visited the site and determined the age of the specimen stratigraphically. Specifically, the specimen comes from the Westbury Mudstone Formation and is around 205 million years old, from the Late Triassic (Rhaetian). The incomplete jaw bone (surangular) of a giant Late Triassic ichthyosaur, collected from Somerset, UK. After seeing the specimen, Judy and I agreed that this was as an incomplete bone (called a surangular) from the lower jaw of a giant ichthyosaur. The bone would have made up only a portion of the entire skull. From here on, I’ll refer to the specimen as the Lilstock ichthyosaur or Lilstock surangular. When I began studying the specimen, surprisingly, I found that there was very few detailed descriptions of surangular bones in ichthyosaurs. Furthermore, there was even less information available on giant ichthyosaur surangulars – they’re rare. Nonetheless, from my experience and from the many papers I read, it was clear that this bone was a surangular because of several notable features present – including a prominent groove in the medial surface (the groove for the Meckelian canal). After comparison with various ichthyosaur surangulars, Judy and I decided to visit the Royal Tyrrell Museum of Palaeontology in Alberta, Canada. Here, we compared the specimen with the largest ichthyosaur known, the giant shastasaurid Shonisaurus sikanniensis, which has a total length of 21 m. After comparing the Lilstock surangular with the surangular of S. sikanniensis, we found similarities that suggests the Lilstock specimen belongs to a giant shastasaurid-like ichthyosaur. 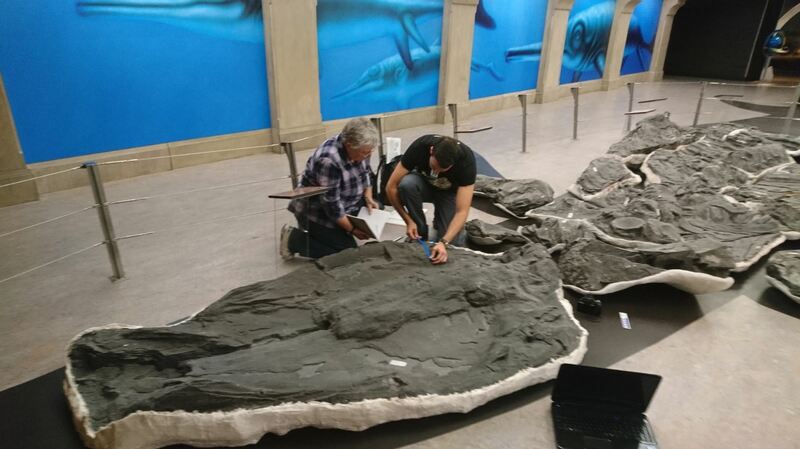 Prof. Judy Massare and Dean Lomax study the giant ichthyosaur Shonisaurus sikanniensis at the Royal Tyrrell Museum of Palaeontology, Alberta, Canada. As the Lilstock ichthyosaur is represented only by a large piece of jaw, it is very difficult to provide a size estimate for the animal. However, by using a simple scaling factor, and comparing the same bone in S. sikanniensis, the Lilstock surangular is about 25% larger and this would suggest a total body length estimate of 26 m for the Lilstock ichthyosaur. 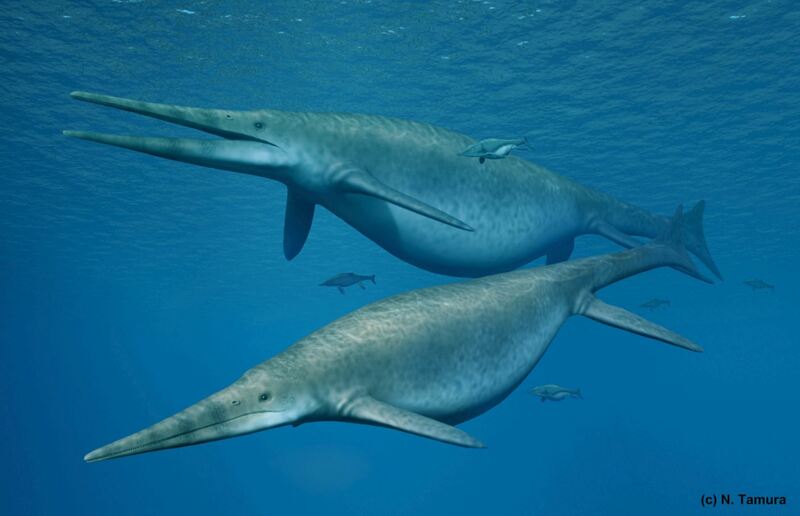 Comparisons with other shastasaurid ichthyosaurs suggest the Lilstock ichthyosaur was at least 20-25 m. Of course, such estimates are not entirely realistic because of differences between species and individual variation. Nonetheless, simple scaling is commonly used to estimate size, especially when comparative material is scarce. In fact, as part of this study, our identification of the Lilstock ichthyosaur specimen as a surangular also led to the identification of another giant ichthyosaur bone from the Late Triassic of France. This bone was previously identified as a fused ichthyosaur mandible. We, however, identify the bone as another single, giant surangular. It bears numerous morphological similarities to the Lilstock surangular and, furthermore, no other ichthyosaur has ever been reported with a fused mandible. Life reconstruction and skeletal reconstruction of Shonisaurus. © Nobumichi Tamura and Scott Hartman. Finally, getting around to the actual title of this article – yes, dinosaurs! Well, in 1850, a large bone was described from the Late Triassic (208 million-years-old) of Aust Cliff, Gloucestershire, UK (also Westbury Mudstone Formation). Four other similarly incomplete bones were also found and described. Two of them are now missing and presumed destroyed. They have been identified as the limb bones of dinosaurs (including, specifically, stegosaurs and sauropods), indeterminate dinosaurs and other terrestrial reptiles. However, with the discovery of the Lilstock specimen, our new study refutes previous identifications and also the most recent assertion that the Aust bones represent an early experiment of dinosaur-like gigantism in terrestrial reptiles. They are, in fact, jaw fragments of giant, previously unrecognised ichthyosaurs. It is probable that one or two of the bones are also surangulars, but as they are incomplete they might be other bones from the jaw, including the dentary or premaxilla. It’s even possible that they could be parts of a giant hyoid (ceratobranchial element), given that the same bone in S. sikanniensis is large (120 cm long; max diameter of 11 cm). I should also point out that other ichthyosaur vertebrae with a diameter of 20 cm have previously been reported from Aust, so the presence of giant ichthyosaurs at this location has already been confirmed. Naturally, given that these bones have been described as belonging to different animals, with the general consensus being dinosaurs, I suspect that this study will generate even more interest in the bones. It is our hope that more of these bones will come to light in both museum and private collections. Benton MJ, Spencer P S. Fossil Reptiles of Great Britain. Chapman and Hall, London. 1995; 386 pp. Buchy M-C, Frey E, Stinnesbeck W, López Oliva JG. First occurrence of a gigantic pliosaurid plesiosaur in the Late Jurassic (Kimmeridgian) of Mexico. Bulletin de la Société géologique de France 2003; 174: 271–278. Butler RJ, Porro LB, Heckert AB. A supposed heterodontosaurid tooth from the Rhaetian of Switzerland and a reassessment of the European Late Triassic record of Ornithischia (Dinosauria). Neues Jahrbuch für Geologie und Paläontologie, Monatshefte. 2006; 10: 613–633. Carpenter K. Biggest of the big: a critical re-evaluation of the mega-sauropod Amphicoelias fragillimus. In Foster, J. R. and Lucas, S. G. (eds.) Paleontology and Geology of the Upper Jurassic Morrison Formation. New Mexico Museum of Natural History and Science Bulletin. 2006; 36: 131–138. Fischer V, Cappetta H, Vincent P, Garcia G, Goolaerts S, Martin JE, et al. Ichthyosaurs from the French Rhaetian indicate a severe turnover across the Triassic-Jurassic boundary. Naturwissenschaften. 2014; 101: 1027–1040. Galton PM. Notes on the Melanorosauridae, a family of large prosauropod dinosaurs (Saurischia: Sauropodomorpha). Géobios. 1985; 18: 671–676. Galton PM. Bones of large dinosaurs (Prosauropoda and Stegosauria) from the Rhaetic Bone Bed (Upper Triassic) of Aust Cliff, southwest England. Revue de Paléobiologie, Genève. 2005; 24: 51–74. Gould, S. J. 1989. Wonderful Life. New York, Norton, pp. 236. Maidment SC, Norman DB, Barrett PM, Upchurch P. Systematics and phylogeny of Stegosauria (Dinosauria: Ornithischia). Journal of Systematic Paleontology. 2008; 6: 367–407. Nicholls EL, Manabe, M. Giant ichthyosaurs of the Triassic—A new species of Shonisaurus from the Pardonet Formation (Norian: Late Triassic) of British Columbia. Journal of Vertebrate Paleontology. 2004; 24: 838–849. Redelstorff R, Sander PM, Galton PM. Unique bone histology in partial large bone shafts from Upper Triassic of Aust Cliff, England: An early independent experiment in gigantism. Acta Palaeontologica Polonica. 2014; 59: 607–615. Reynolds SH. The Aust section. Cottswold Naturalistsʼ Field Club, Proceedings, Gloucester. 1946; 29: 29–39. Sander PM. An evolutionary cascade model for sauropod dinosaur gigantism-Overview, update and tests. PLoS ONE. 2013; 8: e78573. Sanders W. On certain large bones in Rhaetic beds at Aust Cliff, near Bristol. Annual Report of the Association for the Advancement of Science, Transactions of the Sections 1875, London. 1876; 45: 80–81. Storrs GW. Fossil vertebrate faunas of the British Rhaetian (latest Triassic). Zoological Journal of the Linnean Society. 1994; 112: 217–259. Stutchbury S. On a large cylindrical bone found by Mr. Thompson in the “Bone-bed” of Aust Cliff, on the Severn. Annual Report of the Association for the Advancement of Science, Transactions of the Sections 1849, London. 1850; 19: 67. Dean Lomax is a palaeontologist, science communicator and author. 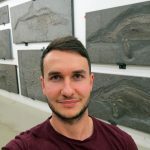 He has spent a decade studying and writing about ichthyosaurs, which have become his specialism.